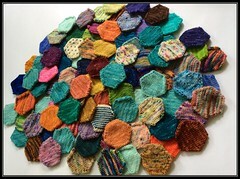 132 hexipuffs complete as of this past Sunday! I recently gathered all of my minis together and came to a conclusion. I have a ridiculous numer of mini-skeins to work with. I didn’t even bother counting them, it is just insane. And to think, I’ll be getting another 10 each month to add the collection! Let’s get to last week’s round-up! I got it into my head that I really wanted to knit with the Black Trillium Fibres gradient kit that I purchased way back in April. I had concluded then that these sets were the best bang for my buck. 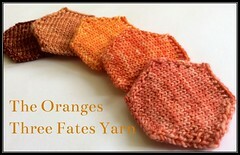 For $39, I get 5 demi-skeins that each produce 10 hexipuffs. That is 50 puffs per kit and less than a dollar for each one. 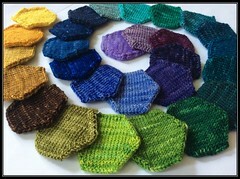 These will be great fillers for the quilt layout I have in mind. I was able to knit 7 more hexipuffs this week! My first package from Knitcrate (yay – more details on that to come!) arrived as well as my yarn from Chiagu’s monthly subscription. I have plenty of minis to keep me busy, but I just seem to collect more and more. Clearly I must knit faster. 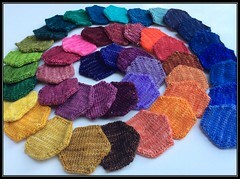 A Return to Hexipuff Knitting!